During the start of MWR, we looked around at promotions and wrestlers to find out who the very best in the Midwest. One team that stood out was the team of Eric Ruffington and Blake Steel otherwise known as Feature Presentation. Feature Presentation had been among the top of the central Illinois tag team scene at one point along with the Hybrids, the Phoenix Twins and Zero Gravity including some great matches at New Breed Wrestling. They finished a strong 8th in Josh Rays MWR’s 2008 Wrestling Revival Cup for Tag Teams. In 2009 they challenged for the PWE Tag team titles during the show titled Damnacrocy but came up short against Zero Gravity. The duo looked to come back at NMW recently to challenge Attitude Inc for the tag titles but struggled to see eye to eye, then unfortunately ,Ruffingtons health derailed the return to the glory.. Blake Steel continues to be one of the top stars in the area including a run with the PWE US title, currently there are the rumors spreading that he may make his way to the STL in the near future . The Nose Bleed Seats interviews PWE and NMW star Blake Steel. The Nose Bleed Seats have a new episode this week. Their guest is central Illinois wrestler Blake Steel as they talk about his upcoming appearance for Pro Wrestling Epic. Take the chance to listen in as Host Chris Lee, Crimefighter and MOAV5706 speak with Blake Steel on his actions against PWE US Champion Brandon Aarrons during his big match against the ROH World Champion Tyler Black. Steel also discusses the taking the opportunity to try out at the MMWA-SICW open door policy, his feud with former Feature Presentation partner Eric Ruffington that escalated after his title match against Jonathan Magnus at New Midwest Wrestling this past July. This and much more and all you have to do is click here. Pro Wrestling Entertainment returned on June 20th with some of the biggest stars in the Midwest. The PWE Champion “Bloody” Harker Dirge was set to defend his title that he had won from former ECW/WWE Superstar Al Snow against the Red Hot Kahagas. Kahagas who just the night before was invited to IWA’S Ted Petty Invitational looked to take the title back to Florida. Also on the line was the PWE Tag team Champions Zero Gravity (Brett Gakiya & CJ Esparza) putting the belts against Feature Presentation of Eric Ruffington & Blake Steel. The PWE US title was vacated so we were treated with a three way between some of the youngest stars in the sport with Krotch, Mark Sterling and Hunter Matthews. Speaking of a dream match a personally one of mine was at PWE when the 2008 MWR Wrestler of the year Jeremy Wyatt was in action taking on the young and exciting Shane Hollister. Other of my favorites was in action too. Curly was there, Mike Sydal, Matt Cage, Nick Brubaker and more showcased the Midwest. With a star studded card from top to bottom the crowd PWE was set though the attendance was small A problem arose and they had to put the ring on the parking lot but that didn’t stop all the wrestlers from going out in the heat and having a great card. MWR Fans I give you a photo essay of PWE. *Mississippi Madman beat Keith Walker by DQ. 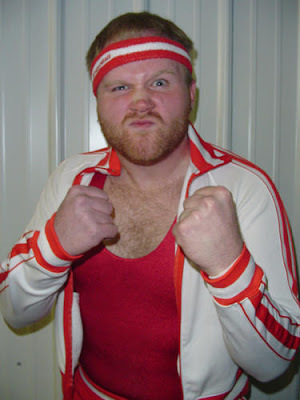 Simply put, a Midwest wrestling show isn’t a show without Sterling, who wrestled in eleven matches for nine companies (MWA, PWE, SCW, PWP, 3XW, AAPW, LWA, MECW, NWA Dynamo) in April. Sterling is also one half of the tag team champions at 3XW with Gage Octane (Gentelmans Club). 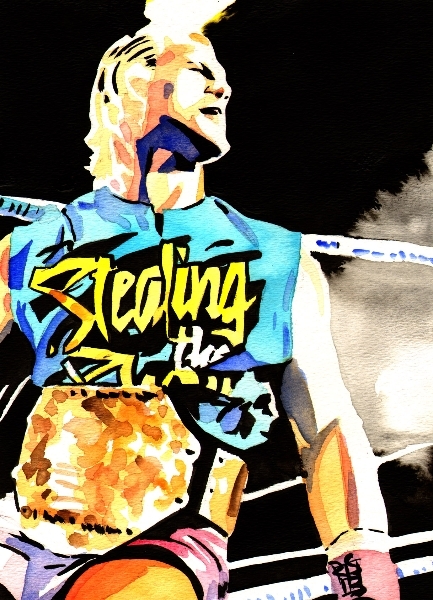 A student of the game Sterling rarely gets outwrestled. Zero Gravity became the first ever PWE Tag Team Champion by defeating The Northstar Express in exciting fashion. At NGW defeated Feature Presentation proving that they are one of the top teams in the Midwest. On April 4th MsChif defeated one of the most talented female wrestlers today Sara Del Rey at LWA. MsChif is widely considered one of the top wrestlers not the Midwest but around the World. One Vote: Mike Sydal?? The crazy MWR Awards commiteee. The quality of the AAPW show in Nashville on April 25th was possibly their best since last year. Our first time in this town, they had a paid attendance of 155. Not too shabby. The crowd was HOT. Yes, it was a bit warm in the Community Center, but not that kind of hot. The card was solid top to bottom. The crowd was so happy that The Nashville Moose Lodge, who raised $1,000 from the event, asked AAPW to set aside 4 more dates for fall and winter of 2009/2010! No match could match the emotion that flowed through the building as the fans wanted the hated Wyatt to lose the belt and didn’t want the loveable Lacey to lose his career. The controversial finish had fans throwing beer into the ring, with Wyatt retaining his title and officially retiring Jordan Lacey. Feature Presentation- Eric Ruffington and Blake Steel. For a complete list of the 2008 MWR Revival cup rankings check it out here! Lethal Wrestling Alliance's undisputed best tag team, "Spitfire" Davey Vega (back) and "Blackheart" Johnny Vinyl (front). At the end of October, Missouri Wrestling Revival reported on the emerging tag team scene in the Midwest. There are great tag teams out there that need no introduction in most regions of the MWR coverage area: Northstar Express, Phoenix Twins, Zero Gravity, Windy City Classic and LONRs are a few of the teams that fit in this category. Other strong teams include the Hybrids, Marc Godeker & Steve Anthony, Abuse of Power, Feature Presentation, Midwest Ground & Air, Gentlemen’s Club and Team W.A.R. These teams are a representation of the depth of tag team wrestling in the Midwest. The real testament to the depth of Midwest tag team wrestling, however, comes in the form of a tag team powerhouse in a promotion with no tag team championship: “Blackheart” Johnny Vinyl & “Spitfire” Davey Vega. As the undisputed top team of the tag title deficient Lethal Wrestling Alliance, Vinyl and Vega have struggled to get the recognition each deserved. That all changed at the end of this past month when not only did they square off against arguably the best team in the MWR coverage area and the entire Midwest, The Northstar Express (Darin Corbin & Ryan Cruz), but they managed to defeat them! The victory moved Vinyl & Vega into 9th place in the 2008 MWR Tag Team Wrestling Revival Cup standings. The Lethal Wrestling Alliance (LWA), Missouri Wrestling Revival (MWR), and even many of the wrestling fans hyped the match between you two and The Northstar Express before the October 24, 2008 face off. Leading up to the match, did you feel it was being overly hyped? Vinyl: No, I didn’t think so. It was going to be our first opportunity to prove ourselves on a national stage. Vega: Yeah. On one hand you have the well-traveled tag team (Northstar Express). On the other, an up and coming team that a a few people know about but just needed that one high profile match to step it up. Vinyl: It was our coming out party as one of the top teams going today, so I felt the hype was justified. How did you prepare for the match? Vega: I was in the gym five days a week for the two months leading up to the match. I also trained at Dynamo Pro Gym on Tuesdays, Thursdays and Sundays. It was the most I have ever prepared myself for one match. The week before the LWA show I slowed it down a bit so that I didn’t overwork myself. Vinyl: I did everything I normally do, but doubled it. I don’t lift weights often, preferring a more cardiovascular workout. I turned my cardiovascular conditioning up a notch because I knew Corbin and Cruz were going to be well-conditioned. I wasn’t going to let them wear us down. What was the atmosphere like in the back on the night of the match? Vega: I’m not going to lie. I was nervous. Vinyl: For me it was a mixture of nervousness and being psyched. Vega: Well, my main goal was to walk out there and have a great match. I wanted to give the fans something to remember. I knew I needed to step up my game to hang with The Northstar Express. Vinyl: I had full confidence in our team and I knew how good Corbin and Cruz are, so I had no doubt that the match would be good. It was all a matter o just how good. For me, it all just sort of washes away once our music hits, though. When it’s game time, it’s game time. Did Northstar Express live up to the hype? Vinyl: In my opinion they did, but that was never a doubt. They are incredibly talented and gave us the fight of our careers thus far. Vega: They are seasoned wrestlers with years of tag experience under their belts, so of course they did. Do you feel that this match puts the two of you on the map? Vinyl: Boy, I hope so. The LWA website (www.lwawrestling.com) said that this was LWA’s best tag team match since the Motor City Machine Guns versus Dingo & Nick Tyson. That’s pretty high praise. I think that if nothing else this match has helped us turn a few heads. Vega: I don’t think it will immediately pu us on the map, but as people begin recognizing how well both teams performed and that we aren’t a joke as a tag team the we’ll emerge as one of the best in the area. Did you go into this match 100% sure of a victory? Vega: If you haven’t noticed, Vinyl and I are very confident individuals. We go out there every time with the attitude that we are going to win. Vinyl: There weren’t going to be any free rides in that match for the Northstar Express. Have you received any more interest from outside promotions since your victory over Corbin and Cruz? Vega: All American Pro Wrestling (AAPW) has a poll on their site (www.allamericanprowrestling.com) for the fans to vote on who they want to wrestle the LONRs for the AAPW Tag Team Titles. I’ve heard that we are ahead in the voting. Vinyl: I’ve never worked for AAPW and Vinyl has only worked there once. I can only assume that some of this notoriety is from our victory over Northstar Express. I would love to work for AAPW because they have a great tag team division and the audience is radically different than what I am used to with LWA. It would be fun. Vega: Outside of AAPW there hasn’t been much interest, yet. I think the shock will need to wear off from our big win and then more offers will roll in. What are your thoughts on the LWA creating a tag team championship? Vega: There have been some talks about tag titles in LWA for a long time, so hopefully it comes to fruition soon. Vinyl: What would be the point in the LWA creating a tag team championship when there is only one team with the talent to hold it? Vega: The belts already have a place reserved around our waists. Where do the two of you go from here? Vega: I plan on continuing to improve and make my name, no matter what it takes. I’ll take whatever challenge is set before me, so any company looking to book me can reach me at daveyvega85@gmail.com or http://www.myspace.com/daveyvega for booking information. Vinyl: There is a list of companies we’d love to work for, like CHIKARA, IWA Mid South, American Luchacore, All American Wrestling, All American Pro Wrestling, Pro Wrestling Phoenix, 3XWrestling, and more. If we continue to have matches like this past one with the Northstar Express, then we’ll be wrestling for them all sooner or later. Any words for tag teams in the MWR coverage area? Vinyl: I think the Midwest right now is in a strange state. We have one of the most shallow single wrestler pools, yet the tag team pool is very deep. We’d love to get in the ring with the LONRs, Phoenix Twins, Hybrds, Zero Gravity, B.A.B.E.WATCH, Osirian Portal, Cheech & Cloudy, Windy City Classic and anybody else we haven’t faced before. We’d love to keep wrestling talented teams like Northstar Express and Ego Express. If you’re a fan of tag team wrestling and you live in the Midwest, I believe right now is an exciting time and it’s only going to get better. Vega: I can’t really add much else other than to say that I look forward to stepping in the ring with any tag team in the area. Vinyl: Oh, and for more booking information for me go to http://www.myspace.com/bncjohnnyvinyl. MWR 3rd Quarter 2008 Awards! Others receiving votes: KC Karrington. Others receiving votes: LONRs (Darrien Sanders & Mark Sterling). Others receiving votes: Todd Countryman.